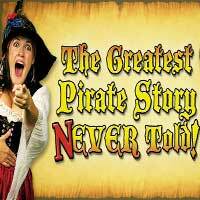 Off Broadway's interactive, improvised musical The Greatest Pirate Story Never Told! will return to dock at the Snapple Theatre Center for a three-show special engagement on President's Day weekend, February 14, 15, and 16, at 11 AM. This limited run comes on the heels of the show's critically-acclaimed holiday production The Greatest Pirate Holiday Spectacularrr! and the conclusion of its first national tour, and includes brand new songs and scenes not included in the original production. Greatest Pirate Story is a unique combination of improvised and scripted musical comedy that follows a misfit crew of pirates-turned-actors. However, after a disastrous squid ink accident, most of their script is blotted out, and the crew must to turn to the audience to help fill in the blanks. Greatest Pirate Story is the brainchild of pirate enthusiast and improv performer Christopher Leidenfrost, who describes the show as: "Pirates of the Caribbean meets Whose Line is it Anyway?" Christopher co-produces Greatest Pirate Story alongside his husband Rick Leidenfrost-Wilson, who also directs the piece. Mr. Leidenfrost-Wilson adds, "We've struck an amazing balance with making this a show that plays to both children and adults. We've had many people come back multiple times because it is quite literally never the same show twice!" Mr. Leidenfrost leads the cast of five quintuple-threat performers who sing, dance, sword-fight, play their own instruments, and of course, improvise, including David Anthony, Olivia Harding, Kevin Maphis and Emily Rouch. The show also includes set design by Katy Roberts, lighting design by Christopher Weston, sound design by Denis Zepeda, choreography by Risa Petrone, fight direction by Randy Kiersnowski and costumes by Scott McNeill. Katy Moore is the stage manager. Tickets for The Greatest Pirate Story Never Told! can be found online at www.greatestpiratestory.com/tickets or by calling The Snapple Theater Center's Box Office at 212-921-7862. Tickets Range from $59-$99. The Snapple Theater Center is located at 1627 Broadway at 50th Street. More information on the show can be found at www.greatestpiratestory.com.